Tonight we returned to the old standby, Great Bowls of Fire. Lisa made this spicy curry that features chicken, sweet potatoes, and various other vegetables and spices. We served it with brown basmati rice. Yum! The flavors work really well together — I love the sweetness of the sweet potatoes and the spiciness of the … spices. Okay, *that’s* going on the blog. This is why I love Great Bowls of Fire: it has the best volume to calories ratio of any of our cookbooks. The recipes are all delicious and you actually feel full afterwards! In a medium saucepan, heat the oil. Add the onion, tomato, garlic, chili pepper, and ginger and cook, stirring, for 5 minutes over medium-high heat. Add the curry powder, cumin, turmeric, and salt and cook, stirring, for 1 minute more. Add the chicken and cook, stirring, for 5 or 6 minutes more. Add the carrots, sweet potato, and broth and bring to a simmer. Cook for 20 to 25 minutes over medium heat, stirring occasionally, until the vegetables are tender and the chicken is fully cooked. Remove from the heat and let stand for about 5 minutes before serving. Ladle the curry into bowls and serve with basmati rice on the side. This entry was posted on Sunday, October 14th, 2007 at 8:49 pm	and is filed under Great Bowls of Fire, Main Dishes. You can follow any responses to this entry through the RSS 2.0 feed. You can leave a response, or trackback from your own site. Hey, I thought yellow food month was September. This looks and sounds delicious! I cannot wait to make it for my husband. Your blog is great and the photography is yummy! 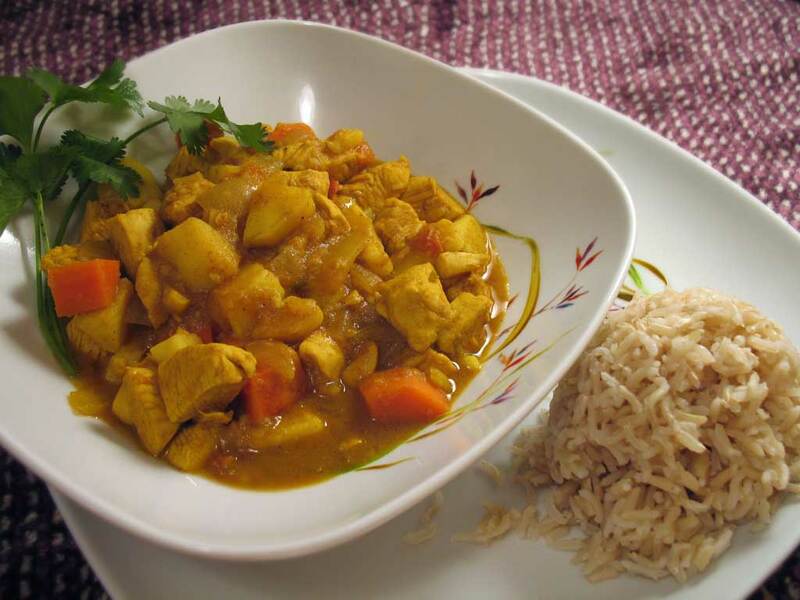 Hi, First time to ur blog.. Well, the chicken curry looks delicious! I havent ever had or thought of a combination of sweet potatoes with chicken curry ! I sure wanna taste that someday.. Thanks for the comments and compliments! It was indeed a delicious combo that we’ll make again. Let me know how it turns out if you make it yourself. This looks like a great way to use chicken and incorporate fall’s bounty of sweet potatoes! And good healthy recipes are alway welcome in my house!